Colin Roope became the third amateur in four years to beat the best of the PGA’s club professionals and take the Be Wiser Insurance Hampshire Open title after a play-off at Hayling. The Blackmoor member produced a gutsy performance over the back nine to haul himself into the play-off with defending champion Jon Barnes, from Lee-on-the-Solent. Barnes shot a fine 69 containing four birdies and just one bogey in the afternoon heat to go with an opening 72. But having made an up-and-down at the last from the greenside trap to tie the leading total of one-under par in blazing temperatures, Roope cooly rolled in a 20-foot birdie putt to grab the Open title from Barnes’ grasp. Firemen had been called to put out a gorse fire on the neighbouring Beachlands par three course while the pair waited to play the par three first. But it was Roope’s putter that was on fire after Barnes narrowly missed the green left, and had to chip on. Colin said: “Hayling is tough enough when there is any kind of breeze. It was very hot – the fairways were rock hard and the greens were baked. “On top of that, the wind was a good 10-12mph with cross-winds on nearly every hole. ‘I played great in the morning to shoot 68 with five birdies, which left me in second on three-under, but I was feeling it after lunch and dropped four shots by the 11th. ‘I was determined not to let it go and fought back with a birdie at the 12th and then hit my six-iron to a foot on the par three 15th. ‘But I also three-putted the par five 14th and after making a four-footer on the last after that bunker shot, the PGA captain Stephen Hunter told me my par putt for a 73 was to get in the play-off. ‘It’s great for the county’s amateurs to win the overall title again. ‘A lot of the club pro’s play tournaments day in, day out. ‘It’s their livelihood. They are not here for a jolly and can all play. 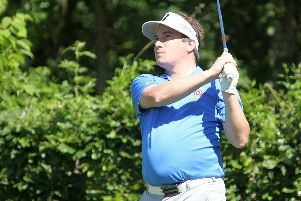 But spare a thought for Hayling’s Ben Wall, the former Hampshire first-team player, who now teaches and plays out of Tournerbury Golf Club on the island, and Swanmore’s Martyn Adams, the 2016 Hampshire Order of Merit winner, who both missed out by one. Wall, one of the most naturally talented players the county has produced, was heading for the first prize of £657, when he took a treble bogey seven on the 17th to finish 69, 73. And Adams took a six at the last to leave his cards reading 72, 70 - tied with Wall on level par to pocket £423 each. Liphook amateur Sam Lemon, who took the Hampshire U21s title at Hayling in 2016, was also a shot shy after a second round 72 that included a double bogey five at the par three 11th.